Every Catholic knows that the Pope is elected by, and from, the Cardinals of the Church gathered in the Sistine Chapel. Every Catholic knows that the Pope then goes to a large balcony perched high in the facade of St. Peter’s Basilica to greet the faithful and receive their acceptance. This is simply the way things are done in the Church. But it’s not the way things were always done. A Catholic in the early Middle Ages would have described a papal election as something like a bar room fight, a back-alley brawl, or a political horse race replete with bribes, connivings, and promises made just to be broken. Everyone—far-off emperors, the nobility of Rome, military generals, influential laity, priests—put their hands on the wheel to turn the rudder of the Church in one direction or another. Papal elections were sources of deep division, causing lasting damage to the Body of Christ. 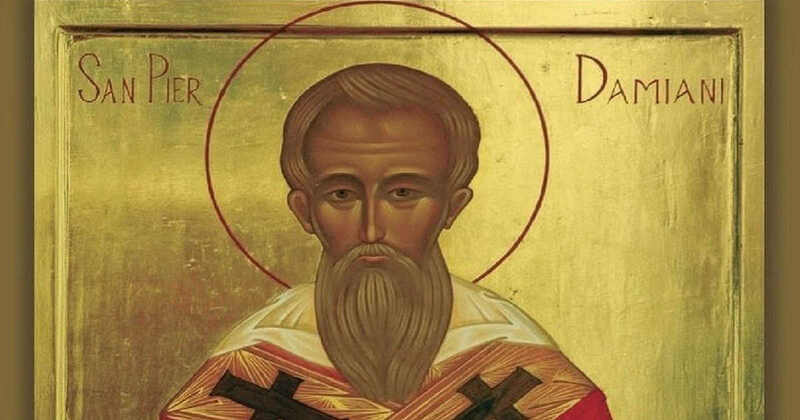 Then along came Saint Peter Damian to save the day. Saint Peter headed a group of reform-minded Cardinals and others who decided in 1059 that only Cardinal Bishops could elect the Pope. No nobles. No crowds. No emperors. Saint Peter wrote that the Cardinal Bishops do the electing, the other clergy give their assent, and the people give their applause. This is exactly the program the Church has followed for almost a thousand years. Today’s saint sought to reform himself first, and then to pull every weed that choked life from the healthy plants in the garden of the Church. After a difficult upbringing of poverty and neglect, Peter was saved from destitution by an older brother named Damian. Out of gratitude, he added his older brother’s name to his own. He was given an excellent education, in which his natural gifts became apparent, and then entered a strict monastery to live as a monk. Peter’s extreme mortifications, learning, wisdom, uninterrupted life of prayer, and desire to right the ship of the Church put him into contact with many other Church leaders who desired the same. Peter eventually was called to Rome and became a counselor to a succession of popes. Against his will, he was ordained a Bishop, made a Cardinal, and headed a diocese. He fought against simony (the purchasing of church offices), against clerical marriage, and for the reform of papal elections. He also thundered, in the strongest and clearest of language, against the scourge of homosexuality in the priesthood. After being personally involved in various ecclesiastical battles for reform, he requested leave to return to his monastery. His request was repeatedly denied until finally the Holy Father let him return to a life of prayer and penance, where his primary distraction was carving wooden spoons. After fulfilling a few more sensitive missions to France and Italy, Peter Damian died of fever in 1072. Pope Benedict XVI has described him as “one of the most significant figures of the eleventh century…a lover of solitude and at the same time a fearless man of the Church, committed personally to the task of reform.” He died about one hundred years before Saint Francis of Assisi was born, yet some have referred to him as the Saint Francis of his age. More than two hundred years after our saint’s death, Dante wrote his Divine Comedy. The author is guided through paradise and sees a golden ladder, lit by a sunbeam, stretching into the clouds above. Dante begins to climb and meets a soul radiating the pure love of God. Dante is in awe that the heavenly choirs have fallen silent to listen to this soul speak: “The mind is light here, on earth it is smoke. Consider, then, how it can do down there what it cannot do up here with heaven’s help.” God is unknowable even in heaven itself, so how much more unfathomable must He be on earth. Dante drinks in this wisdom and, transfixed, asks this soul its name. The soul then describes its prior earthly life: “In that cloister I became so steadfast in the service of our God that with food seasoned just with olive-juice lightheartedly I bore both heat and cold, content with thoughtful prayers of contemplation. I was, in that place, Peter Damian.” Dante is among refined company in the loftiest heights of heaven. 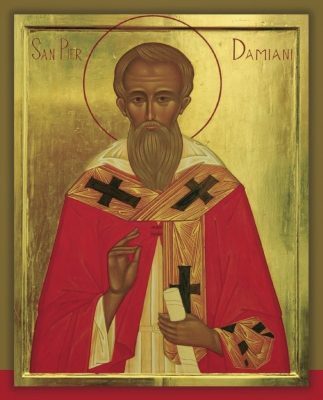 Saint Peter Damian, your reform of the Church began in your own monastery cell. You never asked of others what you did not demand first of yourself. You even endured the detraction and calumny of your peers. Help us to reform others by our example, learning, perseverance, mortifications, and prayers.